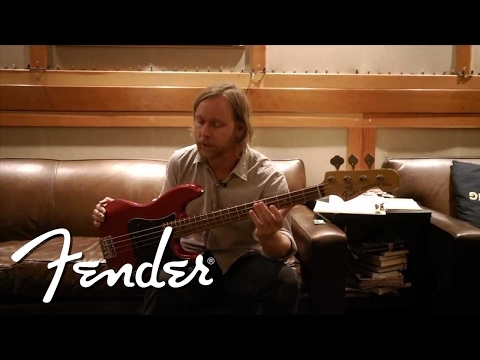 The Fender Nate Mendel Precision Bass guitar in candy apple red has been specially designed for the man himself, to create as close a rendition of his beloved 1971 Fender Precision bass. Having established himself early on with emo band Sunny Day Real Estate, Mendel is probably most famously known for his long career with rockers The Foo Fighters. One constant in all this time has been his faithful 1971 Precision Bass, remaining reliable and true across every album, and throughout a relentless touring schedule. The Fender Nate Mendel Precision Bass body features the smooth contours and shapely curves that make it incredibly comfortable to play. Constructed using ash, the tones produced by this model are a rich and complex as you can get. With a healthy low-end rumble, compact and forceful midrange punch, and a snappy high-end attack, the ash creates an enviable foundation that other models can only dream about. The candy apple red paintwork gives this model a sublime finish, with the 3-ply pickguard providing protection around the pickups and controls to prevent scratching and damage during performances. The paintwork has been given further protection with nitrocellulose lacquer, preserving it for as long as possible. Fitted to the body is a slim "C" profile maple neck that is based directly on the neck on Mendel's '71 P-Bass. Married to the neck is a 20 medium-jumbo fret rosewood fingerboard, with white dot position inlays to aid in your navigation. The 34" neck scale length generates a tight sustain, whilst the maple/rosewood combination delivers each and every note with the utmost articulation. The slightly smaller than average 7.25" fingerboard radius makes it a joy to play across, enabling any technique to be executed with minimal effort. In order to deliver stadium-filling tones, the Nate Mendel P-Bass has been equipped with Seymour Duncan's Basslines SPB-3 Quarter Pound split single-coil Precision Bass pickup. The quarter-inch diameter pole pieces within this pickup expand the magnetic field, giving a wider frequency range to take advantage of the ash/maple/rosewood combination. Control is incredibly simple, with master volume and master tone pots at your fingertips. Do not underestimate the versatility of this setup, as you'll be pleasantly surprised by what this model is capable of: from raucous hard rock tones to hushed subtlety, and everything in between. In order to guarantee the Precision Bass can go at full pelt night after night, Fender have included their Hi-Mass bridge with chrome-plated zinc saddles to uphold intonation with the utmost precision. Strings feels well supported, and the headstock is home to Fender's 70s vintage-style standard open-gear tuning machines who maintain tuning faithfully throughout each and every performance. A neat finishing touch is the inclusion of Mendel's signature on the reverse of the headstock, as well as an additional neck plated with the "Fender/Foos" logo. If you're looking for a bass guitar that is uncompromising, reliable, sounds amazing, and plays like a dream, then the Fender Nate Mendel Precision Bass guitar is the one for you.